I lied, I have internet and delicious vegan brunch in my belly. Richmond, fair city, I love you. And Jessy, thank you thank you thank you for all the yummy suggestions! I’m so stoked after Crossroads; can’t wait to check out more RVA vegan awesomeness. p.s. that was totally my first in-restaurant photo-taking for the blog. It wasn’t too scary, maybe I’ll get more into this! p.p.s. Legends Brewery’s Oktoberfest and Capital Ale House’s beer list blew my mind too. At Capital I had the Allagash Fluxus 2009 which features sweet potatoes and black pepper (peppercorns in the beer! Oh my! ), Ace Pear Cider (tasted like a pear! not just sweetness), and the Blue Mountain Brewery Rockfish Wheat (a local VA wheat beer, tasted ok). Surprisingly, no hangover…it must be something about the quality of the beers. PBR and I should really take a hiatus–so not worth it! That looks yummy! After a while you get used to the stares as you whip out your camera in the restaurant! My kids are confused when I don’t take a picture of our food now! and don’t worry, restaurants are totally used to people taking pictures of their food these days. you sure used to get weird looks a year or so ago though. Oh, wow. I am so impressed by those red tortillas.Why can’t I find stuff like that in Germany? That looks so good. I was thinking “what a great food shot” only to read that it’s your first restaurant shot..you rock! Nice job!! Oh my! It looks great! hooray for crossroad’s yumminesses! i’m so glad you’re hitting up all the awesome places. capital ale is the best – the bar made of ice is the best. i had no idea they had sweet potato brew & pear, too. w00t! hope you’re enjoying the folk festival & lots more rva awesomeness! i feel a little silly taking pictures when we’re dining out, but it’s growing on me and it’s kinda fun, too. happyface! Your blog is sooo inspiring to me! Love the red tortillas!! Hi there! I came across your blog through a friends’ blog–they were raving about your dark chocolate pumpkin brownies–which I am excited to try out soon…ANYway–I will be in Richmond at the beginning of November and I’m wondering if you have any recommendations on where to hang out/eat/sightsee…Besides Crossroads, of course! We’ll totally try that place out due to your blog notes. Isn’t it weird how this internet thing really works? Connecting people and promoting businesses and creativity…Its amazing. Anyway, thanks for writing and listing cool stuff. Hey Britt! I would totally check out jessy’s postings at http://happyveganface.blogspot.com/2009/10/rva-vegan-eatz.html She has a bunch of Richmond recs that I totally checked out (well, ok, 2 of them at least). I only had time to go to Crossroads (I think they listed bagels with tofutti! oh my goodness I haven’t seen that since NYC!) and 821 Cafe. Both had fabulous brunch options, delish coffee, and a great vibe. Love them to death. I’m dying to check out Ipanema too. Anyways, check out Jessy’s blog, it’s so Richmond fabulous! Darn, i was hoping you meant Richmond, London. =) That burrito is inspiring. I make tofu scramble all the time but I always have it with toast. I think I like the burrito form factor better! 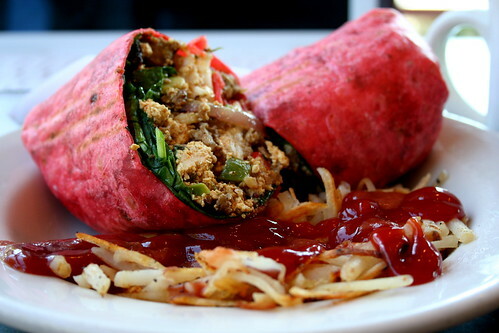 That is a great looking burrito! What kind of tortillas are those? Beautiful photo! Take more restaurant pics! It looks very tasty! I’m totally about to choke on my own drool just looking at that picture. RED AWESOME STUFFED TORTILLA GOODNESS. Such amazing pictures. I love the mountains! Soo jealous! now that is a rocking breakfast.